A 20,000+ strong petition and a fundraiser aren't enough to save the superhero MMO from closure. Just over a month ago, NCSoft decided to shut down Paragon Studios along with its popular superhero MMO City of Heroes. 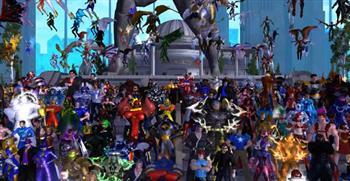 Dedicated fans immediately rallied to prevent their beloved game from being axed, building a petition with more than 20,000 signatures and starting up a "Save City of Heroes" movement. Despite their best efforts, however, the company has confirmed that the game will definitely not be resurrected. NCSoft posted an announcement in response to the overwhelming display of dedication. The company explains that it has investigated all possible options to keep the game alive, including putting both the studio and the intellectual property rights for City of Heroes up for sale, to no avail. "We wanted to let you know that your voices have been heard and your concerns have been taken into serious consideration," the company continued. "We appreciate the overwhelmingly constructive and positive messages in the emails, notes, and packages you've sent in support of the game...City of Heroes has a special place in all of our hearts, and we want to ensure its reputation and the memories we share for the game end on a high note. "We will be holding events throughout the process of preparing for the game's end, and we encourage players and fans of the franchise to join forces and enjoy their time in a game that we've enjoyed supporting for more than eight years." Members of the "Save City of Heroes" movement carried out several campaigns to show the company that there was still strong demand for the game. Fans sent capes and masks to NCSoft employees and messages to the company's CEO, and mass in-game demonstrations were held at key locations in the game's world. The movement even managed to pool together $1,400 to treat the developers to dinner at their favorite restaurant, just to show them how committed the fans were to the game's success. Alas, it was not enough to justify keeping the studio or the MMORPG alive. City of Heroes is scheduled to go dark from November 30th.